*1-Ryo is a big money, most of the regular people in Edo period couldn't afford such amount of money. Hanji Yaizu, a yakuza man, sat on the main street of a town. A crowd and several men surrounded him. "Hey, I just hate things not straight! That's why I rearranged your sedan chairs. Shoot me an arrow or anything if you want." Hanji said in a large voice, bared his right shoulder and held his arms to show his strong spirit. The chair bearers were ready to fight. and came into a crowd to settle it. He found Hanji in it. "Hey, Yaizu-no. What are you doing? Put on your kimono or catch cold." "Oh, Danna! It's been a long time!" They looked happy to find each other. "You're right." Hanji put on his kimono. "Why don't we have some drink somewhere?" They started walking as if nothing had happened. The bearers were not happy about this. 'Wait! You can't go like this' trying to catch them. Hyogo asked Hanji what he had done to them. Hanji explained. "Oh Hanji, you did again?" Hyogo said to the bearers,'You have to excuse him. He didn't mean anything wrong. But they were not so reasonable. "This guy touched our sedan chairs. He has to pay for it." One of them caught Hyogo's neck. Hyogo understood that they had just complained for some drink money. "What shall we do?" Hyogo asked Hanji with smile. They casted back. In a while a pile of bearers were made. "Now, we are ready to go." As they left, Hanji blew his pipe to exhausted bearers, "See? even my pipe is made straight." At a lunch bar, they were happy having a few bottles of sake. They talked about what they had done while they were travelling alone. "I had been so busy escaping from girls following me." said Hyogo proudly. "Following YOU? ha, ha,ha!" Hanji didn't seem to believe him at all. "Then, ask me what I have done! I earned so much by gamble. I wish you were there!" "You did?" Hyogo also didn't seem to care about what they were talking really. "Another sake!" Hyogo called a master of the bar. "Wait, no,no. No more sake" Hanji. canceled the order. Hanji suddenly started counting all the money he has. There were not many. "Hey, Yaizu-no. You said you'd won so much, did you?" "I DID. But sometimes I lost, sometimes I won...probably fifty fifty...I can say." "What!? This is serious. How much is the rest of the bill?" Hyogo took out all of his money...just a handful of coins. Hanji counted Hyogo's coins. "One, two, three, four, ....eleven, twelve, thirteen!" They were relieved. "So this gonna be the last sake for now"
They shared the last cup of sake. A quiet moment after having the last sake. They seemed to become sober quickly. "What are you going to do now, Danna?" he posted me a letter from here 10 years ago." "10 years ago?" Hanji confirmed. The time span Hyogo talked sounded too long to him. "Yes. We, samurai keep promises. Samurai's cord of conduct." "Yea, right. What is he doing here?" convinced of his own words. He took a chopstick and .scratched his back. "You? refined???..... "muttered Hanji. "You confuse me sometimes... I'd better go now." said Hanji seeing Hyogo eating the last pickle by his hand.. They left the bar and started walking for different purpose. 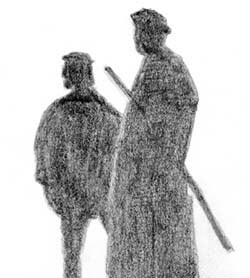 Instead of his long lost friend, Hyogo met another samurai teaching children in the town. His name was Yamakawa. He was happy to have someone from his hometown, Edo. They both used to be a frequenter of the same lunch bar there. "By the way, I would like to ask you a favor, Tukikage-uji" "What would it be?" of the lunch bar I am surely going to pay him?" His son, Shinsuke, had applied to a position of samurai of the castle. 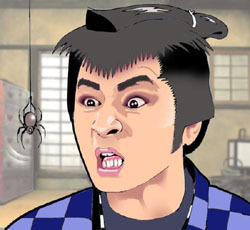 If he passes the final test tomorrow, which will be a game of kenjutsu, he can get the job and some money..
"Sure I do." said Hyogo.with smile. When Hyogo glanced at Shinsuke coming into the house, he was sure he would win. But something wrong was happning on that day. While Hyogo searched his long lost friend, which was failed, Hanji was playing a dise. and asked him to hurt a young samurai for 1-ryo and his kimono. Hanji, who loves justice, refused it. When Hyogo heard about this from Hanji at an inn in the evening, he noticed something wrong going on. to hurt a young samurai for 1-ryo today. Hyogo, of course, didn't like it. "Mmm.." Hyogo reminded what Yamakawa had said. "My son is going to play kenjutsu with a son of a merchant tomorrow. The merchant has bribed to examiners to let his son pass the written exams.. But tomorrow, he cannot use bribe anymore. It is an exam of kenjutsu." On the other hand, both Hyogo and Hanji were asked to hurt a young samurai by tomorrow morning.! Hyogo suddenly woke up and went out of the inn. Hanji ran after him. They saw a few guys runnning from the direction of Yamakawa's house. When Hyogo arrived at the house, he found Shinsuke being injured his left arm badly. "I cannot do kenjutsu tomorrow with such an arm! It's over!" he was discouraged. "Of course, you CAN! One sword for one arm. Isn't it enough!?" Hyogo encouraged him. Hanji, who had followed the guys running away, found them entering the merchant's house. Now it is clear who sent them to hurt Shinsuke! "Come with me, Shinsuke! I will show you how you can fight with one arm!" "Hai"
Hyogo, Hanji and Shinsuke went to the merchant's house. When they broke into the house, examiners had been invited and served sake. now seemed to know everything..
"Watch and learn, Shinsuke!" Hyogo placed his left arm inside of his kimono. He drew his sword slowly and carefully, then quickly responded to the exanimers. They were no match for Hyogo. The marchant's body guard was called. Hyogo recognized him. voice. He was the guy Hyogo had been looking for all the day long! "I thought you had become a good teacher." Hyogo replied with stern eyes. "I liked you. That's why I rent you my last 1-ryo 16years ago. Because of this, I couldn't afford anything but water for a while. I looked forward drinking with you over 1-ryo I rent." "Huh!" The body guard threw a few ryos in front of Hyogo. They stared each other in tense with a sword at the ready. Hyogo hold his sword as high as his shoulder. They crossed a sword. Hyogo swung down his sword over the shoulder of his friend. A moment after, he fell down to the earth. All overed only in a few second. "I'm sorry you had to see your long lost friend in such a sad way, Danna." Hyogo sheathed his sword with no word. Shinsuke came to Hyogo "I've watched you and learned! I will do my best tomorrow's exam. Thank you, sir!" Hanji noticed a merchant and his son being scared in a room. "Hey. where is my kimono?" Hanji yelled at the merchant. "In the next room, sir. Please take your kimono." the scared merchant said. a spider hanging from the ceiling! He barely came out of the room and sat down in panic. "What's wrong with you, Hanji?" Hyogo looked into the room. "Hanji-san dosen't like a spider?" Shinsuke asked . "No! I really can't take this insect." Hanji said losing his breath. "All right, I will bring you your kimono, Hanji." said Hyogo. He rather looked enjoying this situation. When Hyogo entered the room, he found a kitty sitting on Hanji's kimono. Hyogo ran away to the door. "Mr. Tukikage doesn't like a cat?" Shinsuke asked. cat. ha,ha,ha!" Hanji laughed him back. Hanji was looking for Hyogo,"Danna! Danna!" He found Hyogo walking on the other side of the riverbank. "Wait,Danna!" he waved his hand and jumped in the shallow river. He crossed the river never worrying about being wet and caught up Hyogo. There are 130 stories. It started on Oct. 19, 1965 and ended on Dec. 28, 1968. The story is held in the Edo period when Tokugawa, Shogun, reigned the nation. 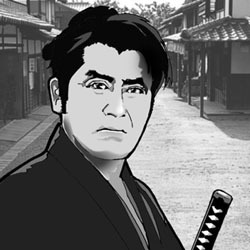 Hyogo Tukikage (Jushiro Konoe) is a samurai who doesn't have a boss. He is traveling as he likes. BUT he stands by the weaks. His heart is as clear as the blue sky. He hates unfairness and the authorities. He is an expert of sword, knife, spear of Jukken Mutoh style. will be just dreaming for a while after being beaten (called 'Mineuchi'). He is strong! stronger than the storongest man! BUT....not so strong to a cute kitty! Yes, he is afraid of a cat. He is usually called 'Danna' by Hanji, who likes Hyogo. Hanji Yaizu(Ryuji Shinagawa) is a young yakuza who doesn't have a boss. He is also travelling as he likes. He makes money by gamblling. He has a straight heart, SO STRAIGHT that even his pipe and sword are made straight! He is also against authorities and becomes hot to unfairness. He has a pride of an alone yakuza man. But his pride can be gone when a spider emerged in front of him! Hyogo often calls him 'Yaizu-no' in a frank manner. Basically they travel alone, but coincidentally they often stay at the same town. samurais fighting each other to inherit the top position of the castle. And what a coincidence! They meet these troubles and help the town back to normal. Don't ask me why, or you wanna ruin this buch of good stories?! 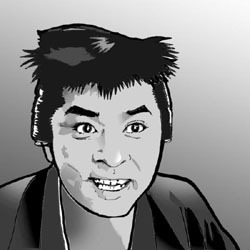 Jushiro Konoe had been a chambara actor for 30 years at that time. He was really good at chambara. Yes, he was! Indeed he was! But I will write about his chambara in another page. Just remember "he was good" for now! Why I emphasize so much? Oh, that because it's true and it is important to each story. At the end of each story, Hyogo drew his sword to give bad guys a lesson. He and Hanji make regular citizens happy again and continue their travel. His chambara accented the story and was essential to end each story and satisfy TV viewers. Each story has a comical scene as well as a serious scene. a marvelous effect on the series. Both Hyogo and Hanji are not always strong. As you see, they have something to be afraid of, that are a cat and a spider. Up till then, a friend of weaks should have been always strong, no weak point for a chambara star. They should have been always beautiful and smart. When a strong good guy showed his weak point, the viewers felt him very close to them. running away from a cat (a spider) in a flurry was so funny. 'Surounin Tukikage Hyogo' ended not because it became unpopular. BUT it ended because it was TOO POPULAR! The latter stories were made from a new script, that were so apart from the original. So the original author asked not to use the title 'Hyogo Tukikage'.anymore. But nobody really wanted to end this popular whole stories. the new series 'Suronin Hanayama Daikichi' started! Of course with the same casts, staffs, just Hyogo left Hanji and Daikichi(Jushiro Konoe,of course!) joined! The story went on with a different title. There are many people who still miss "Suronin Tukikage Hyogo"
Although Tomoe-sama has a site to support a star other than J. Konoe, she drew Hyogo and Hanj (1& 2)in her site. As it is impossible for us to watch the series now, please visit her site to see how they were. Tambourinman-sama is collecting a sign-up petition for producing Video and DVD of samuraui vagabond. Unfortunately it asks you a little bit complicated process to sign up. So, if you are interested in, pls send me an e-mail for the procedure.